Often abbreviated as BK, Burger King is one of the largest fast food chains in the world. With headquarters in Florida, the company was founded in 1953 with the name ‘Insta-Burger King’, and was renamed in 1954 after new ownership took over. Today, Burger King has over fifteen thousand outlets in 100 countries. 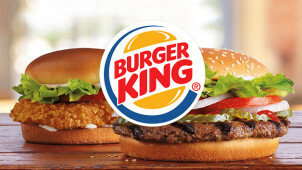 Since they began, Burger King’s basic menu has expanded, and today, you can not only enjoy the classic burgers, fries and fizzy drinks on the menu, you can also enjoy chicken burgers, wraps, snacks and light bites, vegetarian and fish burgers, desserts, and milkshakes. If you're a big fan of the BK menu, follow them on Facebook and Twitter for all the latest news and be the first to know when there is a new burger or milkshake on the menu. Get great tasting food on-the-go for less with vouchercloud, when you download our money-savings vouchers on your mobile app today. How do I use my Burger King voucher? Scroll up and select your chosen discount or deal. When you click on it, you’ll be given a unique voucher code, if needed. Chow down your discounted burger! Don’t forget to check out the King Savers, where you can find a whole range of tasty snacks and small meals for just 99p. Choose from the Hamburger, Cheeseburger or Chicken Burger, fries, Chicken Nuggets, Chilli Cheese Bites, soft drinks and coffee, sundaes, or a chocolate cookie! All of the King Saver products are available on their own or as an accompaniment to your meal. What are Burger King’s opening hours? The opening hours vary depending on the Burger King restaurant that you’d like to visit. To find out the opening times for your nearest Burger King or any other BK restaurant you’re planning to visit, you can use the Store Locator tool on their website where you can find all the information you need. Does Burger King offer vegetarian options? Yes! Burger King offer a varied menu with plenty on there for vegetarians to choose from. Veggie bean wraps and burgers can be ordered as part of a meal, and for pescatarians, there’s a tasty fish burger available too. Or, for cheese lovers, try the Cheddar Whopper! Nacho Cheese Bites, Chilli Cheese Bites, fries, and desserts are also all suitable for vegetarians. Can I get Burger King delivery with my order? Yes! However, you will need to check whether Burger King offer delivery in your area. To do this, you can enter your postcode on their website. Where can I find nutritional values? To find out more information on ingredients and nutrition, you can search various menu items on their website, where more information is listed. Alternatively, if you’re eating at Burger King, their helpful staff will be happy to answer any questions that you have regarding allergies and any other nutritional information. You can get in touch with Burger King via their contact page here. Trust Burger King to always delivery great-tasting food at a price you can afford. Since 1954, Burger King have been one of the leading fast food hamburger chains on the high-street, using top-quality ingredients in their classic recipes for a fun and family-friendly dining experience. Grab a bite to eat on the go with a money-saving Burger King voucher from vouchercloud, and you could save on the classic Whopper, the Bacon Double Cheese Burger or the Original Chicken Sandwich. Visit Burger King online and find your local BK today! If getting dressed to go out the house today seems a little beyond your state of mind, why don’t you treat yourself to Burger King delivery? The perfect way to satisfy your hunger without forking out for pizza or takeaway, Burger King can be your fast food of choice for lazy days in 2017. We’ve always got great deals available, so check out the menu and order your meal online in just a few clicks. With Burger King’s range of deals and special offers, you can choose from a range of meal options on the UK menu for just £3.99. Just collect up some spare change, and use our Burger King offers to save on your meal today. Pick from the Big King, Chicken Big King, Long Deluxe Cheeseburger or the Sweet Chilli King Wrap with fries and a drink included for this special price. Or, if you want to try something different, check out the current King Deals.